Being a movie fan in 2017, I realize how spoiled I am. Blu-ray, 4K, Netflix, Hulu, YouTube…the options to watch films are legion. The same thing applies to movie trailers. Now, rather than waiting to see coming attractions in the theater, the trailer for the next Hollywood tent pole is up before you can say “box office.” Hell, they now have teaser previews FOR THE PREVIEW. As I look around and acknowledge these cinematic advantages, I can’t help but feel nostalgic about the way I used to get that information. In the 80s other than seeing a trailer in the theater, the first time you saw anything regarding new films, were TV spots. I fondly recall watching whatever my favorite television show was at the time and seeing an advertisement for a new movie. I remember that sense of excitement I experienced knowing that something cool was coming to the theater and if I begged my parents enough, maybe, just maybe, they’d take me to see it. Such was the case with director Fred Dekker’s 1987 classic, The Monster Squad. While a box-office flop and almost universally panned by critics at the time, in the thirty years since it’s release, the film has attained cult status among its loyal followers. I count myself as one of those followers. I remember being eight years old in the summer of 1987 when I first saw the commercial for The Monster Squad. All the classic Universal monsters were in it: the Wolfman, Count Dracula, Frankenstein’s Monster, the Mummy and the Creature From the Black Lagoon. (Or as he’s referred to in the movie, Gill-Man.) Furthermore, the group of people combating the forces of darkness weren’t some suped up special forces group but…kids. Regular ordinary kids like myself. In my pre-adolescent brain this movie was the equivalent of Citizen Kane. So of course I was there opening night August 14, 1987. Yeah see the film was PG-13 and despite how much I begged and pleaded to go, my Mom wasn’t having it. Too scary she said. Too violent she said. However, she did change her tune about six months later when it was released on home video. (Remember VHS kids? And Blockbuster Video? 23 Skidoo!) Mom watched it with me and surprisingly, enjoyed it. While she may have enjoyed it, I was obsessed. I must have watched it at least three times the weekend we had it, and as soon as it was on TV I recorded The Monster Squad and watched it until the tape wore out. Hell I even started my own Monster Squad with my friends the next summer. Granted we didn’t do much but hang out at the pool and talk about monsters but that’s beside the point. So what makes The Monster Squad so great? I’ve always been a fan of movies where the opening scenes are like prologues. The Monster Squad‘s opening scene where Abraham Van Helsing confronts Count Dracula at his castle, sets the tone for the entire film. There’s an eerie quality and atmosphere that evokes the classic horror motifs that The Monster Squad honors: creepy castle, darkened rooms lit only by low candlelight, the screech of bats in the rafters, skulls…it’s all there. After the confrontation, the film fast forwards 100 years to “The Present Day.” I don’t know about you but I love it when after a prologue that’s clearly a scene set in the past, that they then cut to a tagline of “The Present Day.” It’s so quintessentially 80s and you don’t see it much anymore. Yup. That Shane Black. The same man who wrote the first two Lethal Weapon films and Iron Man 3. Technically Dekker shares a writing credit with Black but The Monster Squad is almost completely Black’s baby. Regardless the film possesses that nice balance between scary and funny. Moreoever, the film captures the affinity that young kids (especially males) have for monsters. The squad is obviously terrified but they’re also just happy to be there. This is their dream come to life. The opportunity to be the Monster Squad for real. What kid in their right mind wouldn’t want that!? In that sense Black’s script captures the child-like wonder of being in that situation. The Monster Squad is Stranger Things thirty years BEFORE Stranger Things. By the time 1987 rolled around several different iterations of classic monsters had hit the big screen. Films like The Curse of Frankenstein, The Howling, An American Werewolf in London, and The Lost Boys (also released in 1987) re-imagined those classic monsters. That’s not to say that those incarnations were bad. Things need adjustments every once in a while. It’s the reason Lara Croft looks slightly different now than when she did in the first Tomb Raider video game. However, it was a nice spin to present these monsters audiences were long familiar with, in a classic way. The juxtaposition of classic monsters from the 30s and 40s against a 1980s aesthetic, unexpectedly works. Dracula (Duncan Regehr) dresses in classic Bela Lugosi regalia: black and red cape, hair slicked back, white makeup, red lips. The Wolfman (Jon Gries) –same deal: ripped white shirt and jeans. Ditto Mummy, Frankenstein’s monster, and Gill-Man. You can’t get more iconic than Frankenstein’s monster (Tom Noonan) dressed up all in black, with giant boots, a square head, and bolts in his neck. 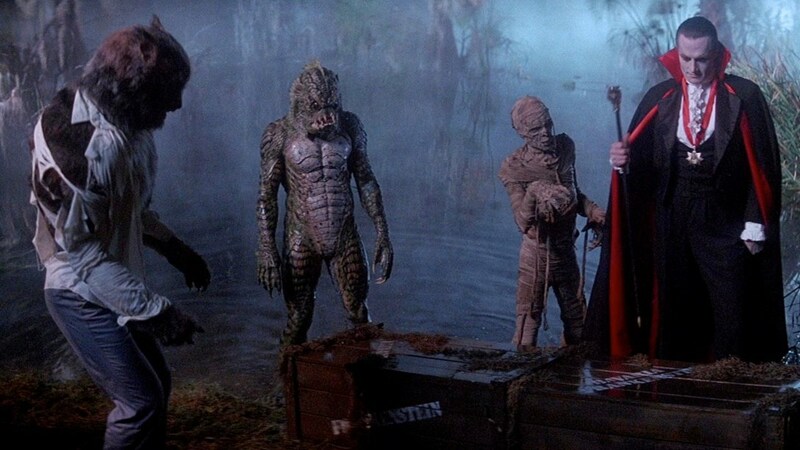 I think what appeals the most to fans of the film, is how realistic the friendships feel in The Monster Squad. It feels like anyone, Sean (Andre Gower), Patrick (Robby Kiger), or Horace/Fat Kid (Brent Chalem) could be a guy in your individual circle of friends. Yes they are somewhat two-dimensional (the movie’s 82 minutes long so there’s not a lot of time for character development) but that doesn’t take away from the chemistry of the group. Any overweight child probably felt a kinship with Horace/Fat Kid who was constantly picked on in the film. Older kid Rudy (Ryan Lambert), the rebel who smokes and wears a leather jacket BUT still rides a bike, represents a fat child’s fantasy: an older, cooler kid who stands up for him. That scene where Rudy makes Horace’s tormentor eat a stepped on Snicker’s bar is the ultimate revenge–even if it is fantasy. One of the main plot points of The Monster Squad is that the de facto leader Sean finds the journal of Abraham Van Helsing (Jack Gwillim) which contains the secrets that helped him seal Dracula in limbo. (God that description even SOUNDS like something a 12-year-old would cook up.) Unfortunately, it’s all in German. Fear not! There happens to be a Scary German Guy played by Michael Cimino who lives in the neighborhood. 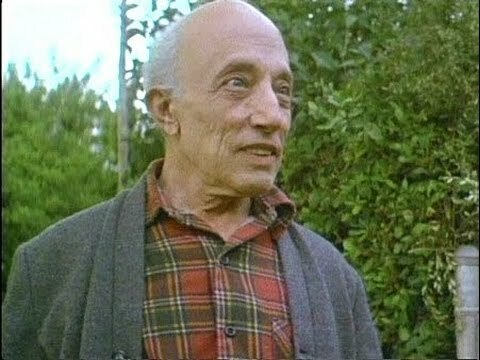 The man is the ultimate archetype of a creepy neighbor, so much so that the character isn’t even given a real name. Seriously, the credits list him as Scary German Guy. Yet much like Old Man Marley, Kevin’s neighbor in Home Alone, SGG ends up being a nice personable man that helps the squad…and serves them pie. Like a deux ex machina he’s able to translate the book and eventually helps them overcome the forces of darkness. Patton Oswalt once wrote that even in bad movies (not that The Monster Squad is one but it’s not The Bride of Frankenstein either) you sometimes find little moments of brilliance. There’s a great moment with SGG where Horace says, “Man you sure know a lot about monsters.” To which SGG replies “Now that you mention it, I suppose that I do.” As he shuts the door on Horace, the camera pans down to show a Nazi concentration camp tattoo on his wrist. That scene still gives me chills because it’s such a poignant moment that parallels the supernatural monsters and the REAL human monsters of the German War Machine. For a kids monster romp movie that’s essentially The Little Rascals meet the Universal Monsters, this is a very heavy moment in the film. In the end a girl saves the day! With each passing year women in film are breaking past old stereotypes and kicking down the door of the Old Boys’ Club in Hollywood. The critical and commercial success of Wonder Woman, a female led superhero film, directed by a woman director (Patty Jenkins), is just one of many examples of the female ascendancy to (hopefully) a level playing field. On a surface level the Squad may appear to some as misogynistic. It’s an all boys club, with a sign on the tree house that literally says “No Girls Allowed.” I think this criticism is overly harsh. These are young boys. A “No Girls Allowed” club, monster-centric or otherwise, is nothing new. There’s no malicious intent here. Sean’s sister Phoebe “Feeb” (Ashley Bank) while initially rebuffed by her brother’s club, ends up being integral to the Squad’s ultimate triumph over darkness. For one, she’s able to get Frankenstein’s monster on their side in order to combat the other monsters. Secondly (and more importantly) it’s Phoebe’s recitation of Van Helsing’s diary in German, with the assistance of Scary German Guy, that opens the hole into limbo, leading to Dracula’s destruction. It’s a brilliant narrative move by Dekker and Black to flip the paradigm. In the midst of an adolescent male driven film, the ultimate savior/heroine ends up being a girl. Remember…his name is Horace mofos. If you need any further proof that The Monster Squad is every ten-year old boy’s “fighting the forces of darkness” fantasy come to life, the ending of The Monster Squad should dispel that notion. Not only does Sean banish Count Dracula to the Void, Van Helsing himself emerges from the Void, grabs Dracula and drags him into the netherworld. As if that wasn’t cool enough, Van Helsing actually gives Sean a “thumbs up” as he disappears. That part is cool in and of itself, but what happens next is truly insane. After the Squad saves the day, the ARMY SHOWS UP. That’s right Eugene actually called the United States Army, explained the situation, and they showed up in force-tanks, soldiers, missiles, heavy-duty fire power–everything. And in a true drop the mic moment, when the Army colonel asks someone to explain what happened, Sean says they can, hands him a business card, and tells him “We’re The Monster Squad.” Pan out as the Monster Squad theme plays. Now I can’t in all honesty say that The Monster Squad is a “good” movie. However, the definition of “good” is a very nebulous and subjective term in my mind. Is it “good” from a movie critic/theory/industry standpoint? Probably not. Is it entertaining? The entertainment value of The Monster Squad is as real as the fact that the Wolfman has nards.